West Chelsea Historic District. Image: Courtesy of NYC Landmarks Preservation Commission. Property owners unsuccessfully petitioned for exclusion. 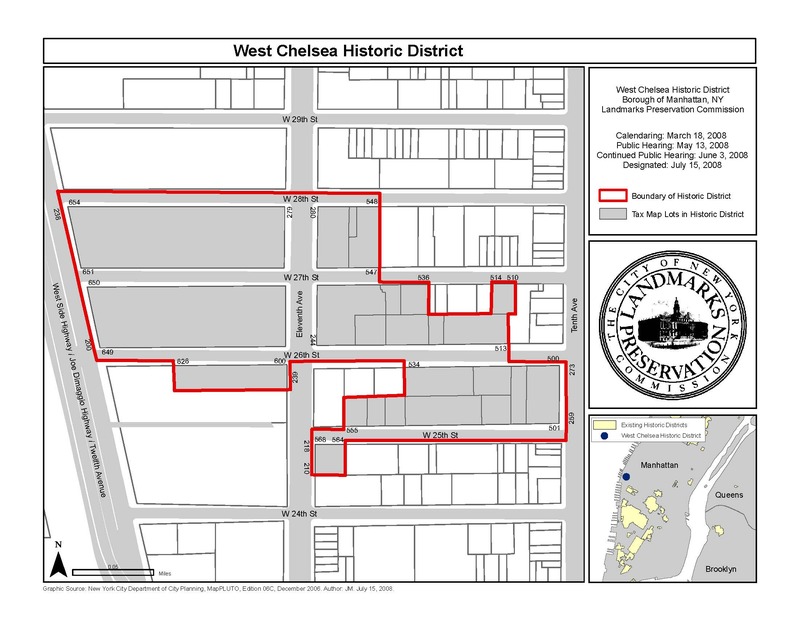 On October 23, 2008, after contentious hearings at the Landmarks, Public Siting, & Maritime Uses Subcommittee, the full Council voted to approve the designation of seven more blocks for the West Chelsea Historic District. When the matter was before the Landmarks Preservation Commission, several property owners in the area expressed opposition to the proposal, or asked that their property be carved out of the district. 5 CityLand 78 (June 15, 2008). At the Subcommittee hearing on October 2nd, a representative of the New York Terminal Warehouse Central Stores testified that the owners had planned to sell the property to Related Companies, developer of the nearby Hudson Yards project, for apartment conversion, and now stood to lose over $100 million. He called the designation “a political effort to stop development.” James Pastreich, owner of properties at 547 West 27th and 554 West 28th Streets, pleaded with Subcommittee Members to exclude the 28th Street site, which currently houses a bar. Pastreich wanted to use his air rights to build a six-story building at the site. Council Member Charles Barron stated that he was willing to vote against designation based solely on Pastreich’s testimony, while Council Member Miguel Martinez inquired as to whether Pastreich’s 28th Street property could be cut out of the district. Landmarks’ representative Diane Jackier explained that the 28th Street building was the oldest in the district, and was considered an important contributing structure. Subcommittee Chair Jessica Lappin adjourned the meeting, so that the Subcommittee could further examine the issues, and perhaps tour the district. When the Subcommittee reconvened on October 21st, it quickly voted to approve designation, with only Barron and Council Member Annabel Palma opposing. At the Land Use Committee, the same held true. Council Member Vincent Ignizio stated that while he generally voted against a landmarking opposed by property owners, he would support this one since it was an extension to an existing historic district. The full Council followed suit a few days later. Council: West Chelsea Historic District (Oct. 23, 2008).